At New Place Fencing we specialise in fitting garden gates and fences of all kinds to commercial and domestic properties, providing a superb service and highest quality workmanship. 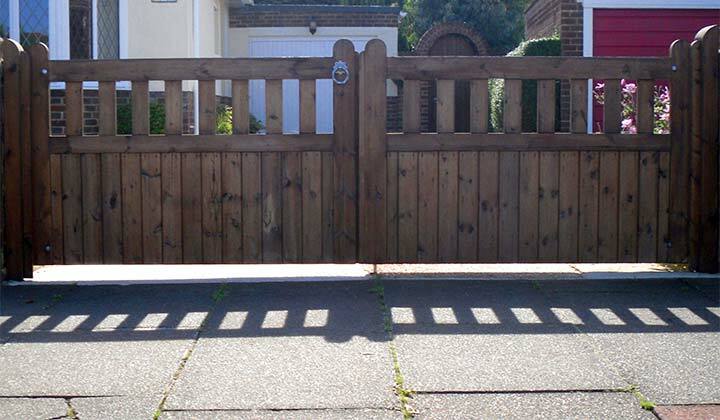 Starting with a FREE survey full of advice and recommendations, and proceeding through the complete garden fencing installation including fitting gates or add-ons like garden trellis, we make it simple for you to get a great looking wooden fence that does exactly what you want it to. Garden fencing panels and commercial gates are what we do best. We have something that best suits the style and design requirements of every homeowner and commercial business owner, just speak with our specialist team and we are sure to design the perfect fence for your property. We have a specialist team of garden fencing installers that utilise years of experience to provide domestic and commercial clients with exceptional wooden fencing and gate installations. No matter the requirements, we have a solution. Give us a call today on 01903 725232 and we will arrange a FREE site survey and no obligation quotation. Specialising in fencing of all kinds we offer private homeowners an extensive choice in wooden fences and gates that can be purely decorative picket fences, privacy creating closeboard fencing or even high security styles. We directly employ a small team of highly experienced garden fencing installers who bring professional quality work with a friendly attitude to every project. Installing a wide range of commercially styled fences and gates such as high security steel palisade fencing, we work closely with our clients to understand exactly what they are looking for, enabling us to recommend custom made products ideal for the job. With the range including everything from high security steel through to simple railings including anti climb systems,we can also have matching commercial gates bespoke sized to provide plenty of access space. There are so many different types of domestic and commercial fencing and gates it can be difficult to decide what you want, and many of them are designed for specific uses. As part of our service we will help you pick out a garden fencing design that meets your needs and that you love the look of, and this brief guide to a few of the main styles, plus information on our bespoke wooden gate design and build service can help you start considering the right fence for you. Our experienced team provide garden and commercial fencing installations to homes and businesses across the West Sussex area, guaranteeing the highest quality standards and service. Some of our most recent work was completed in Midhurst, Littlehampton, East Preston, Worthing, Steyning, Shoreham, Crawley, Hove, Brighton, Haywards Heath, Arundel, Rustington, Ferring, Goring, Angmering, Horsham, Pulborough, Bognor Regis, Billingshurst, Chichester, Emsworth and Portsmouth. Whatever wooden fencing you have in mind for your property, give our expert garden fencing and gates team at all for plenty of advice and a superb installation service; contact us today to arrange a no obligation survey and estimate with one of our friendly team.